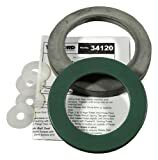 Camco RV 4" Bumper Caps have vented hole for air circulation and easy removal. Durable lifetime polyethylene construction. 2/pack. Measures 4-1/8" x 4-1/8" x 1-1/4"
Disconnect sewer fittings with ease with the RhinoFLEX Sewer Fitting Wrench. Compatible with any Rhino, Revolution or Easy Slip bayonet or lug fitting, simply attach the wrench to the fitting and turn to loosen or connect. 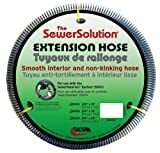 Great for tightening and loosening hard-to-turn fittings and disconnecting from sewer outlets and dump stations with minimal contact. RhinoFLEX Sewer Fitting Wrench is a reinforced lightweight durable design built to last. Dometic Toilet Seal Kit, 2001 & Newer. ORIGINAL TOTE-ALONGS - Five convenient sizes from 5 to 30 Gallons provide a capacity for every need. Blow-molded polyethylene construction and quality zinc plated steel brackets throughout. Extra large, heavy-duty wheels and standard bayonet fittings included on all tanks except 5 Gallon size. Tow bracket and 5 foot sewer hose included with 15, 22, and 30 Gallon Tote-Alongs. All original Tote-Alongs come completely assembled. 22- Gallon ORIGINAL TOTE-ALONG TANK 37 inch Length x 20 inch width x 10 inch height; 16 pounds empty. 22- Gallon Tank. Longer length extension hoses including 15' and 25'. Replacement parts now available for the SewerSolution system (SS01). Camco RV Gray Water Seal Sewer Fitting gives an airtight odor and leak seal when RV gray water is drained into the campground sewer system. It includes easy Gripper to secure hose. Valterra Products, Inc. EZ Coupler 90 Degree Bay Sewer Fitting - Now a universal, threaded sewer fitting with a standard bayonet end. Makes 6 different types of sewer connections with a gas-tight fit. The standard bayonet fitting can be used to easily mix and match sewer hoses. A bedside commode brings convenience to its user but who likes to clean it up after use? Rest assured, the CareBag® Toilet Bowl Liner will effectively collect and contain any body fluids and better yet: they will be turned into a gel! This is made possible thanks to the super absorbent pad provided with each bag. When the patient is done performing body functions, the bag is to be sealed using the easy drawstring closure system and disposed of in household waste: Say goodbye to spillage, awful smell and hand cleaning of the commode pail! The Toilet Bowl Liner can also be used to convert a toilet in a dry toilet in a disaster planning / emergency preparedness context. Perfect for homecare use, it fits all bariatric/non-standard bedside commodes. Never clean a pail again! The super absorbent pad turns up to 16oz of body fluids into a gel within seconds.